After celebrating over 40 years together with the same trio line-up, UMe continues the celebration of the Rush catalog with the release of three 40th anniversary expanded editions of the band’s classic 1976 album 2112. On December 16th, 2112 – 40th will be released in three distinct variations. The 2 CD/DVD edition will include a newly remastered CD of the original 2112 album by Abbey Road Studios, and an additional CD of rare, live and previously unreleased material including newly-recorded tracks from 2112 featuring Dave Grohl and Taylor Hawkins of Foo Fighters along with Nick Raskulinecz, Billy Talent, Steven Wilson from Porcupine Tree, Jacob Moon and Alice In Chains. The set’s third disc is a DVD featuring a newly restored vintage 1976 Rush concert recorded at the Capitol Theatre in Passaic, NJ, plus bonus videos of the Grohl/Hawkins/Raskulinecz track and Billy Talent track, and a new 25+ minute interview featuring Rush guitarist Alex Lifeson and longtime producer and engineer Terry Brown. The new 2112 remaster originally appeared on the much-acclaimed 2015 hologram vinyl edition of the album; this marks the Abbey Road Studios master first time on CD. UMe is also releasing a three LP 200-gram vinyl edition incorporating all of the aforementioned audio material, plus a special laser-etched LP side, the 2015 hologram on 2112’s side B and a unique turntable mat featuring the band’s iconic Starman character. Fans will also have the option of purchasing a Super Deluxe edition of 2112, incorporating both CDs, the DVD, all three LPs plus its bonus items, and several exclusive collectable items including two 12-inch x 12-inch lithos, one featuring Hugh Syme’s original Starman pencil sketching, the second showcasing a 1976 Massey Hall ticket stub; a reprint of the 1976 Massey Hall handbill and three buttons featuring each band member, all housed in a box lined with velvet flocking. 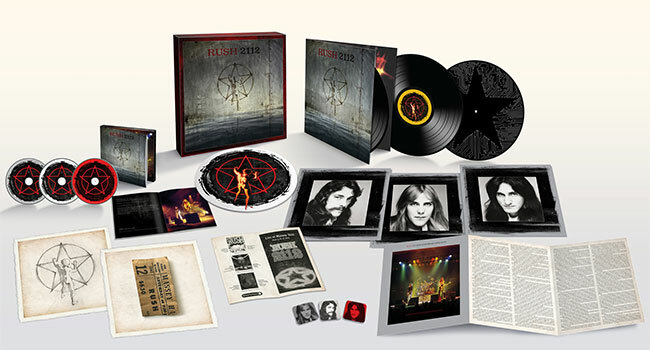 For the first 1,000 Super Deluxe pre-order purchases at Rush.com, the purchaser will receive a limited edition seven inch pressing of the album’s first single “The Twilight Zone” (b/w “Lessons”) and a custom red star 45 large hole adapter ring, both newly designed by Hugh Syme. All three versions of 2112 – 40th feature extensive liner notes by renowned rock historian Rob Bowman, and newly designed artwork by longtime Rush art director Hugh Syme. The set’s rare recordings include “Solar Federation,” spotlighting the isolated Neil Peart vocals that close the song “2112” in “Grand Finale,” two outtakes from the 1976 Massey Hall concerts including “Something For Nothing” and a nearly complete 15+ minute performance of “2112,” as well as a recently-rediscovered live version of the album track “The Twilight Zone,” which has only been performed twice in the band’s long history. The epic 2112 album which guitarist Alex Lifeson described as “the first record where we sounded like Rush,” is widely regarded as a crucial landmark in Rush’s body of work. Although it was the band’s fourth album, it’s generally considered to be the one on which the band’s epic sound and ambitious conceptual approach blossomed. Resisting record-company pressure to focus on shorter, more radio-friendly songs, the band stuck to its guns and constructed the album’s seminal seven-part, 20-minute title piece, a conceptual suite set in a dystopian future. In addition to its status as a creative landmark, 2112 was also Rush’s commercial breakthrough, becoming the band’s first album to reach the Billboard LP chart and the first Rush album to achieve Gold sales status in the U.S. (it was subsequently certified Platinum). 2112 was also Rush’s first platinum album in Canada, spawning a now-legendary Canadian tour that culminated in a three-night stand at Massey Hall in Toronto, which was recorded for Rush’s first live album, All the World’s a Stage. 2112 is one of two Rush albums listed in the book 1001 Albums You Must Hear Before You Die, and it ranked second on Rolling Stone’s 2012 readers’ poll of “Your Favorite Prog Rock Albums of All Time.” In 2006, the non-profit Audio-Visual Preservation Trust of Canada chose 2112 as a culturally significant example of Canada’s audio-visual heritage.